Youth (Under 18): Free when accompanied by an adult or senior. Welcome Back - Royal Society Jazz Orchestra. This band has wowed our audiences 4 times before. Tickets sell fast. Don't wait! 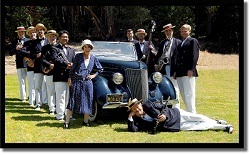 Don Neely, vocalist Carla Normand, and the ten-piece Royal Society Jazz Orchestra of San Francisco are renowned for authentically performing the exciting sound of Big Band Swing, Hot Syncopated 1920s Jazz, 1930s & 1940s Swing, Blues, Dixieland, Vintage Jazz, and Traditional Jazz. They perform for parties, concerts, weddings, vintage weddings, and jazz festivals. They do it all, from romantic background music to the hottest dance band rhythms and jazz - and everything in between. Innovators such as Duke Ellington, Benny Goodman, Paul Whiteman, Count Basie, Fletcher Henderson, Bix Biederbecke, and Louis Armstrong are among the RSJO's inspirations. They have an unmistakably authentic sound, yet, you will discover upon seeing them live and hearing their recordings, that the Royal Society Jazz Orchestra has a colorful style of its own. Dancers love the infectious rhythms of the Royal Society Jazz Orchestra. Popular dance steps include Swing, Fox Trot, Lindy Hop, Waltz, Tango, Charleston, Rumba, Samba. They play songs by George Gershwin, Fats Waller, Irving Berlin, Hoagy Carmichael, Cole Porter, Walter Donaldson, Harold Arlen, and Johnny Mercer. Also in their colorful repertoire are songs from Tin Pan Alley, Vaudeville, the Cotton Club, and Art Deco-era cinema and Broadway.